One of the classics of Mughlai Cuisine, which my home town Hyderabad is famous for, is Korma. It was brought to India by the Mughal rulers from Persia in mid 16th century. Once it reached India, it amalgamated with local influences and developed a style and taste of its own. Korma is also spelled as Khurma, Qurma, Qorma depending on the region or cultural background of the person you are talking to. It is made with Chicken or Goat or Lamb or Beef or just all vegetarian. Even a sweet variant exists, called Sheer Korma! All this variety speaks volumes about its versatility. So naturally, there is no one single recipe for Korma. Rather, it is a technique of using some of the classic but common ingredients and spices. Korma requires marinating the meat overnight in spices, and browning it before simmering in a rich and flavorful yogurt based sauce. The usual suspects of Indian cuisine, such as Cloves, Cinnamon, Cardamom, Ginger and Garlic are present. To add a depth of richness, a combination of nut pastes (Cashew, Almonds and Chironji) is used. Poppy seeds are also used, and are essential to impart the unique flavor and texture typical of Korma. Korma recipe varies from region to region as does any age old recipe. Here I have the ‘standard’ recipe using Chicken. You can simply substitute any meat you prefer. If you don’t want any meat, use Paneer (Indian cheese) instead, and follow the same process. One unique ingredient which may be hard to find is Chironji nuts. They look like puffed up hulled watermelon seeds, and taste like nothing else I can compare it with! It is perfectly alright to omit them, instead of buying a bag to just use a spoonful. Having said that, I do not recommend substituting Garam Masala for other spices here, because Garam Masala does not have enough Cardamom and has a wider variety of spices which are not required in Korma. But if you must, I won’t stop you! Just add a few Cardamom pods to it. The goal is to create a flavorful gravy to pair with Naan or Rotis or mildly flavored rice. * Traditionally only yogurt (homemade) is used. I find that homemade yogurt has a slight tang, which store bought yogurts lack. So I use a bit of Sour Cream which imparts a perfect sour note and consistency, and also prevents yogurt from ‘breaking’ if left on high heat. Marinate Chicken with Turmeric, Salt, Red chilli powder, Ginger-Garlic paste and Lemon juice mixture for an hour. Or even better overnight. Heat a wide non-stick pan on medium and add 2 tablespoons of oil. When hot, add Chicken and brown the pieces. Remove and set aside. Chicken need not cook completely at this stage. In the same pan, add a teaspoon of oil and roast the onions. Once onions are lightly browned, add Cloves, Cinnamon, Cashews, Almonds, Chironji and Poppy Seeds, Ginger-Garlic paste. Roast them all for another 2-3 minutes. Cool and make a fine paste adding 1-2 tbsp of water as necessary. In the same pan, add remaining oil and once hot add slit Green chillies and Onion-Nut paste and cook on medium until oil separates, about 8-10 minutes. Add the browned chicken pieces and about 1/2 cup water and cook on medium for 15 minutes. Drop the heat to low and add beaten Yogurt and Sour Cream. Mix well and simmer for 5 minutes. Check and adjust salt. Add more red Chilli Powder if needed. Add more water if thinner gravy is desired. 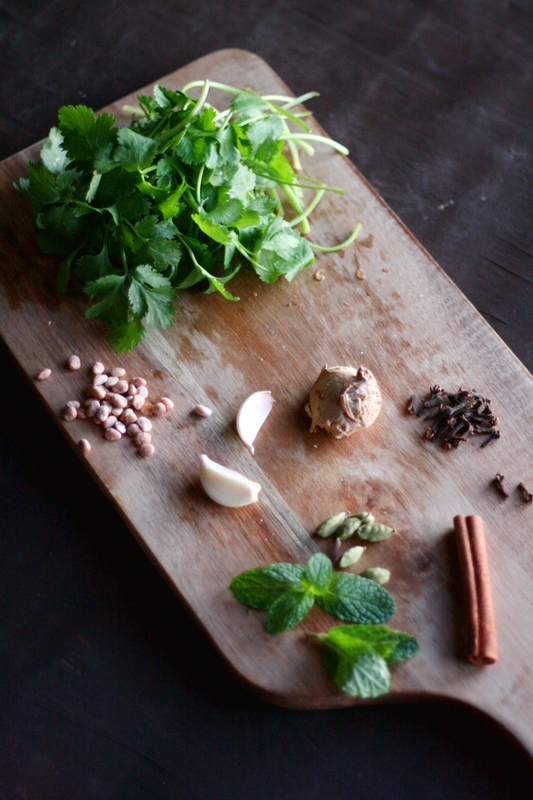 Remove from heat and garnish with Mint and Cilantro. Serve hot with Naan or Rice. This entry was posted in Recipes and tagged Chicken, Classic, Main course. Bookmark the permalink. Looks yummy! I can’t wait to try it in my slow cooker. 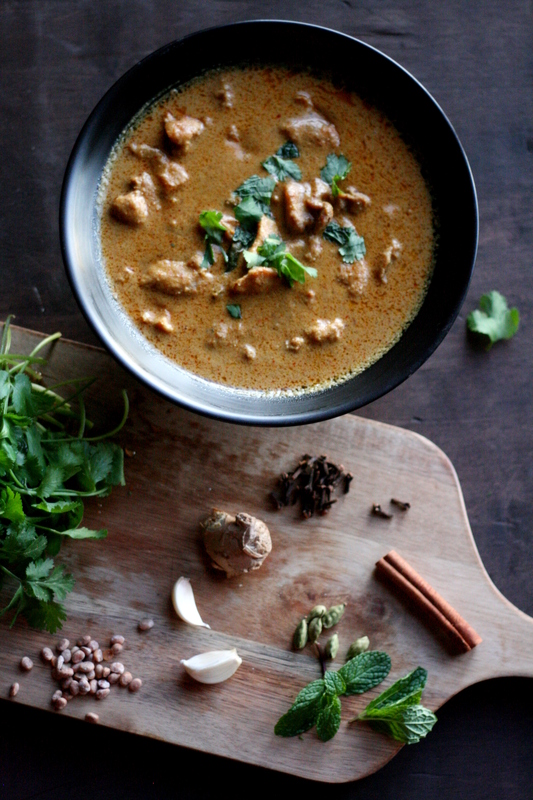 Lovely recipe – I adore chicken korma. Lady if i could hug you I would!!! This recipe was sooooo unbelievably delicious!! Thank a million times!! !